Jet setting in all its glory is fabulous, and has so many awesome opportunities and benefits attached. This earth day is coming up on April 22nd, and I can’t stop thinking about our great world and how we want to see it all. However, tourism and fuel use for long and overseas flights can wreak havoc on our earth, ecosystems, and atmosphere. Although we can’t control the fuel economy used for long flights, we can control other factors that help offset this environmental strain. It is important to be responsible tourists to keep these beautiful places thriving. To me, the saddest thing that is happening to our oceans and planet right now is the littering of plastic everywhere. Not only is the production of plastic harmful and wasteful, it also harms our wildlife and litters our landscapes. 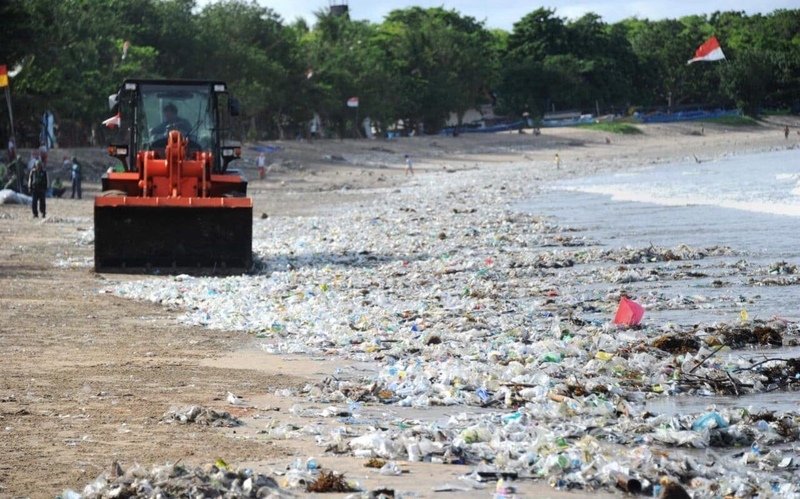 Especially as avid travelers and scuba divers, we see the devastation that plastic specifically is causing to some of the otherwise most glorious beaches and waters in the world. I want to do my part so we can still enjoy the marine life and beaches that are on this beautiful planet. This was a New Years resolution of mine that I have been working on consistently, but I find it even more important when traveling. I am not perfect, and I am still trying to find more ways to be more consistent and better. It is possible to reduce our use of them by some simple preparation. Porter and I brought our refillable bottles all over Europe and did not use one plastic water bottle or straw 🙌🏻 It is a little win, but think if everyone did this how much better off we’d be! My three big “no-no’s” are: no plastic one-use water bottles, no plastic straws, and no plastic bags. And I mean carry one everywhere. Ditch the iced coffee straw, and Ask waitresses and waiters to skip them. Why use a straw one time that is going to be on our planet forever? Amazon has some awesome Reusable straw packs that you can throw in lunch boxes, purses, and keep at home. I recently found and bought This handy little reusable k-cup to use with loose-leaf teas and coffee in your Keurig. It is cheaper than the k-cups, and is one less little plastic cup saved! This is a big *duh* moment, but the main thing here is remembering to bring them. Keep them in your car, and place them back there when you are done unloading groceries. I think Europe has the best approach to this problem in charging people for plastic grocery bags! 25 cents a bag really adds up, and We found this out the hard way in Iceland when grocery shopping, but made sure we could carry our groceries and brought the bags we purchased the first time with us the next trip. Imagine the uproar if we did this in the U.S. If people Were charged for each bag they used at the store, I think we would think twice about using as many or bringing our own. Second to disposable straws are disposable forks and spoons. Bring a silverware kit (what can you not find on amazon?!) with you, especially on road trips where fast food or take out is going to be common. on our most recent trip I tested out Bar shampoo and conditioner. No plastic containers, takes up half the space on your bag, and smells and worked amazing! This is where I bought my Shampoo and conditioner bar. This May be a TMI subject, but switching to the diva cup has been one of my best wellness moves in a long time. For those who do not know, the Diva cup and other menstrual cups are reusable silicone cups, that you can wear up to 12 hours of protection on your period. Long plane ride tried and true, it reduces plastic tampon applicator and sewage waste, and you don’t have to pack or worry about how many feminine products to bring on your trip. I have had mine for over a year and is still in great condition. I can’t help but think of all the tampons and plastic applicators I would have used in over a years time, and on their website Here, it breaks down just how much you are helping. It is a win for the environment and for you. What plastic saving tips do you already use? And please comment with who will commit with me this earth day to reduce their plastic use! Randi, this is fabulous! I was just telling my Mom 2 days ago, that they just had to stop using single use water bottles. SAVE THE FISHIES! I love my stainless water bottle and just recently bought a glass one too. I will commit with you to use less plastic!! I will start taking my own bags to the store. If it’s a store with paper, I usually get those and use them for my recycle items. Yes!! Save the fishies! Each little bit helps so thank you for putting in the effort.